Whole grain rolled oats, brown sugar, food starch-modified, salt, natural flavor (plant source), barley malt extract, caramel color (the oatmeal without brown sugar does not contain brown sugar, but adds maltodextrin). This a classic example of a food company taking a healthy food, adding a bunch of chemicals, colorings, preservatives and sweeteners to make it “better” (read = cheaper and lasts forever on the shelf). Thanks but no thanks. I’ll stick to my boiled rolled oats with fresh apples, unsweetened raisins, cinnamon, cooked with good old water. 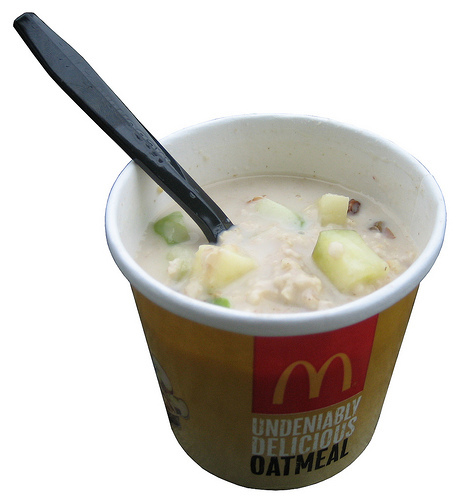 It’s amazing how McDonalds can turn a simple healthy food into a complex bad food. Oatmeal 21 ingredients, come on!